I never expected to be a gardener. As a kid, I was the de facto laborer in my mother’s garden and always excited to have the weeding and watering over as soon as possible. Despite finding gardening work hard and boring, I gradually blossomed into a trail worker, which I suppose some folks might find just as tedious and laborious as I found gardening. However, I found something really fulfilling about working to preserve the public lands where crowds come to play. And, in general, the public lands are pretty good places to avoid gardening chores. After a few seasons of trail work, I began working as the Camp Dodge Facility Coordinator in the heart of the White Mountain National Forest (WMNF). As Facility Coordinator, I live on site and deal with the day-to-day operations that keep the place running so that the volunteers will keep coming back to do their work on the trails. I’m a steward to the stewards, in a way. After my own seasons of trail work and understanding the stewardship that such work engenders, I find that helping Camp Dodge run smoothly so that more and more people can have that experience is a nice way to give back. While Camp Dodge has long facilitated programs on stewardship and conservation both on and off the trail, the budding national conversation on sustainability and local agriculture has led the AMC in recent years to look more closely at this aspect of environmentalism and conservation, and for ways to include those topics and practices in as many aspects of the organization as possible. However, as the special use permit administrator Thomas Moore at the Androscoggin Ranger District within the WMNF had been encouraging DeLucia, my-self, and AMC Trails Volunteer Programs Coordinator Kelsey Heeringa to consider longer range plans to maxi-mize the use and potential of Camp Dodge, a garden in the Forest became a clearer and clearer idea. Working in partnership with Moore and the District Ranger, Katie Stewart, DeLucia and Heeringa drafted a proposal for the creation of a garden at Camp Dodge Volunteer Center. 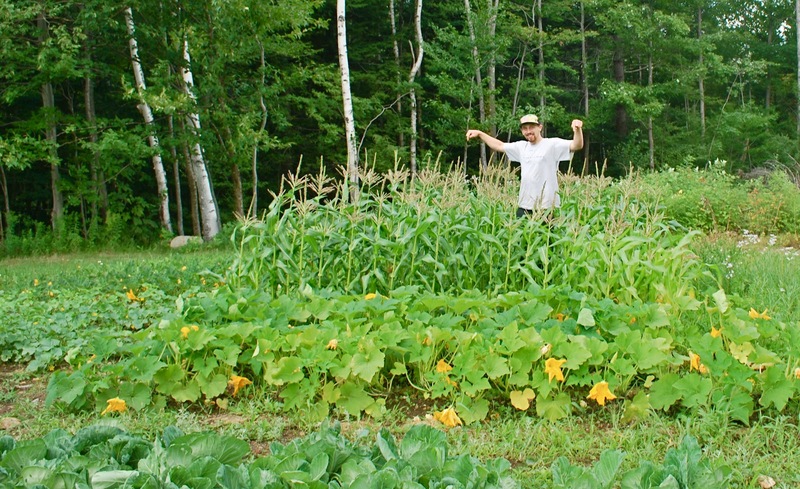 The support from the White Mountain National Forest allowed the AMC to follow through with quality food production and local, sustainable food production on public lands. The benefits we anticipated were the use of the Camp Dodge garden as another tool to engender another type of hands-on stewardship in volunteers, as well as provide fresh foods for the volunteers and staff, both on and off the trail. It might seem like the real work of this garden is in the planting, weeding, watering, tending, and harvesting. However, all of that was perhaps easier and more predictable than collaboration between a Federal land management agency and a non-profit stewardship organization. A garden is relatively simple, really. The WMNF has a herb and vegetable garden at the Russell Colbath House along the Kancamagus Highway, after all—gardens can and do exist on National Forest land. But the novelty of planting a garden in a partnership between a public land agency and a non-profit conservation group, this is new and potentially fraught territory. Fortunately, the historic spirit of cooperation and collaboration between the WMNF and the AMC remains robust and all stakeholders were willing to consider expanding what both the Forest’s motto “many uses” and the AMC’s motto of “conservation, recreation and education” could—and should—include. With all the excitement of drafting the proposal and waiting for approval, it hadn’t really dawned on me that I, as the Facility Coordinator at Camp Dodge, would be also be the lead on-site gardener. Like I said, my thumbs aren’t exactly green and my enthusiasm for the garden was more theoretical than practical. 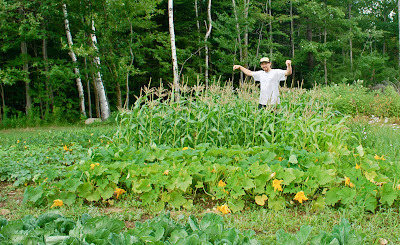 However, once the garden was approved and the seeds donated from Johnny’s Selected Seeds of Albion, Maine, the actual down and dirty work of the garden fell to me. Swallowing my childhood dislike for gardening, I brought my trail ethic of working hard to the fields. And, lo and behold, food flew out of the garden and I was having a blast! While the 700 or so volunteers who came through Camp Dodge this summer weren’t entirely supported by the 300 pounds of food we grew, we were fed, literally, by the fruits of our labors and by the fertile, vibrant partnership between the WMNF and the AMC. Both agencies are seeking to be the best stewards of this land—it is a pleasure to be fed, even in part, from the land itself. Things went so well with the garden that we submit-ted a second, separate proposal for apple trees and berry bushes. After extensive biological review by the USFS, we were approved and planted a few apple trees and blueberry bushes around Camp Dodge. We had to be careful where we planted the apple trees—the AMC’s Research Department has been monitoring air quality at Camp Dodge as part of a long-range study and if the trees were too close to the sensors, the base-line air quality would improve too drastically for the study. These apple trees may be non-native to the WMNF, but these early benefits seem to outweigh the potential detriment. The full long-term impact, like most conservation and stewardship efforts, remains to be seen. What we do know is that the volunteer trail programs out of Camp Dodge leave lasting impressions with the teens and adults that participate in them. People always seem to be looking for real and practical articulation of their connection to the land. Volunteers talk about coming away from their experiences with a more conscious mind about the natural world around them and a greater understanding of what it takes to manage such large quantities of public land. The diverse range of ideas, concepts and methods that Camp Dodge imparts to kids and adults is powerful, important, and joyful. What’s hard, though, is taking these lessons of stewardship and green thinking out of the woods and bringing them into our busier lives outside the trails and mountains. This garden at Camp Dodge has provided a way for people to connect the natural world with their world at home. It presents the idea that you can bring the natural world and all its wonders where ever you might find yourself living. Maybe you can’t build bog bridges in your backyard to keep the idea of stewardship alive, but I’ve learned that planting a tomato isn’t all that difficult. Nor, apparently, is bringing disparate entities together to move towards new, diverse, ideas of what is the wisest and best use of land for the public and for the continued stewardship of that land. The idea in environmental education and stewardship is to get a child to care about one tree in their yard, and then the nearby forest, and so on until there is a global environmental ethic. How about this? I started building trails in the WMNF, grew a garden on that same ground, and am now headed to Argentina to learn more about organic farming. The more I’ve done, the more I want to know about the variety of ways to be a good steward. And, like a garden, stewardship and environmental ethics grow from fertile ground and cross-pollination of ideas.